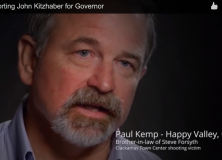 Forsyth’s brother in law, Paul Kemp, of Happy Valley, Oregon is seen on video talking about the heart break of losing his brother in law and the need to keep guns out of crazy people. Agreed. But then he then endorses John Kitzhaber. What do these two things have in common? Almost nothing. First of all, that crazy guy in the Clackamas Town Center shooting stole the AR 15 he used from a friend. There was no way a law–or politician for that matter–could have stopped that exchange. The group uses the non existent connection between laws that would have stopped this theft–an illegal act–and the taking of the stolen gun to the Clackamas Town Center shopping mall–a gun free zone–and shooting people as somehow something that could have been stopped by another law–or John Kitzhaber as governor. Let’s see, who was governor then? Well, I’ll be, it was John Kitzhaber! Heckuva job, Kitzy! He doesn’t bother to add that Nick Meli was a good guy with a gun that day who stopped the bad guy with the gun at the shopping mall. So many inaccuracies and intentional fuzziness and so little time to rebut.